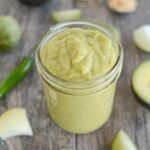 This Spicy Green Sauce is made with roasted tomatillos, avocado and just a few other ingredients. Combine them all in the blender for a simple, flavorful sauce that’s good on everything from chicken to vegetables! Line a baking sheet with foil. Peel the papery skin off the tomatillos and cut into quarters. Roast at 400 degrees F for 20 minutes. Pour roasted tomatillos (and the liquid on the pan) into a blender. Add onion, garlic, avocado and pepper.